Previously we reported on a fundraising program to support rice farmers in Laos to adopt dry seeding technology—traditional methods of hand-transplanting rice seedlings are very labour intensive and limited by unreliable monsoon rains. The Crawford Fund partnered with Dr Leigh Vial, a NSW farmer with experience in Asian farming systems, to encourage individual Australian farmers or groups to provide Lao rice farmers low-cost but well-designed mechanised seeders, which are well-suited to a range of conditions in the small farmer fields in tropical Laos. “Thus far the scheme has succeeded in attracting six donors and this has given us the ability to sponsor ten seeders for our first sponsorship round,” reported Dr Vial. 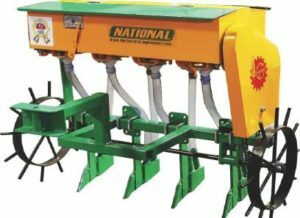 The donated seeders have now been specified and priced with National Agroindustrial, a farm equipment manufacturer in Punjab, India. The four-row seeders are capable of seeding a range of crops in a range of situations, and are able to travel easily between fields. Colleagues in Laos—in particular the Savannakhet Provincial Agriculture and Forestry Office—have identified ten villages in four districts, and commenced the process of calling for proposals from those villages. With Dr Vial in attendance, this process should ensure that motivated and capable farmers receive the sponsorship. “I am excited about what we can achieve and hope to attract more sponsors as we continue to demonstrate success. Drill seeding continues to gain in popularity in Savannakhet (Lao’s biggest rice-producing province) and we have a chance to speed the rate of innovation amongst farmers, manufacturers and support staff to help farmers get good results quicker in a wide range of conditions,” said Dr Vial. For more information on the project and to find out how you can help, download the flyer here: Rice Seeders for Laos Farmers or contact Leigh on leigh.k.vial@gmail.com or 0403 489 848.